nanjIyar and periyavAchchAn piLLai highlight that great musicians and dancers have arrived to wake emperumAn up and serve him. Thus, thoNdaradippodi AzhwAr requests emperumAn to wake and accept their service. The kinnaras, garudas, gandharvas, etc., are playing many blemishless musical instruments such as one sided drums, single stringed instruments, double sided drums, vINai, flutes, etc., making loud sounds which spread in all directions. Some have been arriving throughout the night and others in the morning. Great rishis, dhEvas, chAraNas, yakshas, sidhdhas, etc., have arrived to worship your lotus feet. Oh my lord/master lying down in srIrangam! (Thus,) you kindly wake up and bless them your audience in the grand assembly this morning. thoNdaradippodi AzhwAr says to emperumAn – all the different types of devotees have arrived and are eagerly waiting to have your dharsan. So, since you are the protector of all, kindly wake up and bless them and engage them in your service. 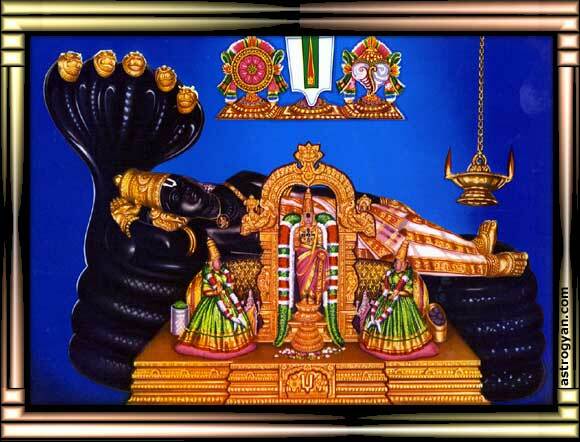 In this pAsuram, thiruvEnkatam (thirumalA) which is the abode of thiruvEnkatamudaiyAn (srInivAsan) who has blakcish-blue bodily-hue (the color of a pure high quality pearl) is also glorified as the abode of yALi (a lion like huge animal with an elephant-like-tusk), lions, gold, precious stones, pearls, flower-bearing-trees, forests which is abundant of water-falls that bring along valuable gems, monkeys and hunters. Here, the principle is, emperumAn has descended to thiruvEnkatam to bless all these different types of entities which are seen in the mountain. This entry was posted in mudhalAyiram, thiruppaLLiyezhuchchi and tagged thiruppallyezhuchi, thondaradippodi alwar on January 8, 2015 by Sarathy Thothathri.